Happy Fiesta Friday #27, (hosted by Saucy @Saucy Gander and Margot @Gather and Graze)! Thanks to all of you who stopped and commented and liked my post last week. Not only was it my first time hosting Fiesta Friday, I also shared a bit of my own family heritage in relation to my My Grandma’s Banana Pudding. To date, it’s the most popular post I’ve ever done on the blog- something I really wasn’t expecting, but am very grateful for. Thank all of you for making me and my lovely Grandma feel so appreciated and welcome. I really do appreciate that. One of the earliest memories that I have of pizza will always be associated with John, the guy that always made our Sunday night pizza at the local Papa John’s Pizza. Now, this wasn’t a Papa John’s of the huge franchise with the jerk CEO that to this day I absolutely refuse to buy from. This was a small, independent chain that I don’t even think went outside of our city. There was no design on the pizza boxes- they were just plain old white cardboard, with a piece of scotch tape pasted on the edge to keep it closed. They were also dirt cheap, which was really the only way that we could afford to eat pizza back then. (These were the much ‘leaner years’, you understand.) Every Sunday night, my mom would pile me and my sisters into the back of our 1988 Delta and we would drive down to the Papa John’s for our large pepperoni and ham pizza, where John the Pizza Guy would always, without fail, be there to greet us with a smile. If I close my eyes, I can still see his face. He was tall and ginger haired, with freckles all over his face and arms. His voice was nasal, and to be honest it reminded me of the voice of Telly from Sesame Street. l really liked him. He had an infectious smile and in all the many times I saw him, I never once saw him in anything but a bright and cheery mood- despite the fact that he always seemed to be working in the store alone while one other guy that we never saw much of strictly did the pizza deliveries. John had a wife and (if my memory serves me right) four small children at home. I remember hearing about them and thinking that someone as nice as he was must have been a really good daddy, even if he couldn’t be with them on Sunday night. It may have been cheap, but that pizza was so good. The crust was crisp and browned on the outside and fluffy on the inside. The cheese was perfectly browned and not laid on too heavy, while the sauce was sweet and slightly thick. John sure could make a good pie, and we faithfully went to get it every Sunday night, then went home to watch The New Adventures of Lois & Clark (remember that show?) over dinner. Unfortunately, that Papa John’s closed a while ago and has since been replaced with several other businesses that never seem to hang around that long. Still to this day, every time I drive past it I remember John the pizza guy with his warm smile and Telly-voice that made such good pizza for me and my family. It’s always a really good memory. Apart from loving pizza itself, I like trying out other foods that try and duplicate the flavor of pizza. It’s a great way to try and get your pizza fix in without constantly eating it all the time (not that I EVER get tempted to do that or anything). One weekend, I decided to make two dishes that would achieve just that, and I think the results were great. I got this idea from a recipe for meatloaf that I’ve been using and loving for a pretty long time. Instead of making it into one loaf, I thought that I could instead mold it into meatballs, bake them off, then simmer them in a delicious pizza sauce. I could see these making a great appetizer or game food, but we just ate them as a main course over rotini pasta. So, what’s the general consensus here? 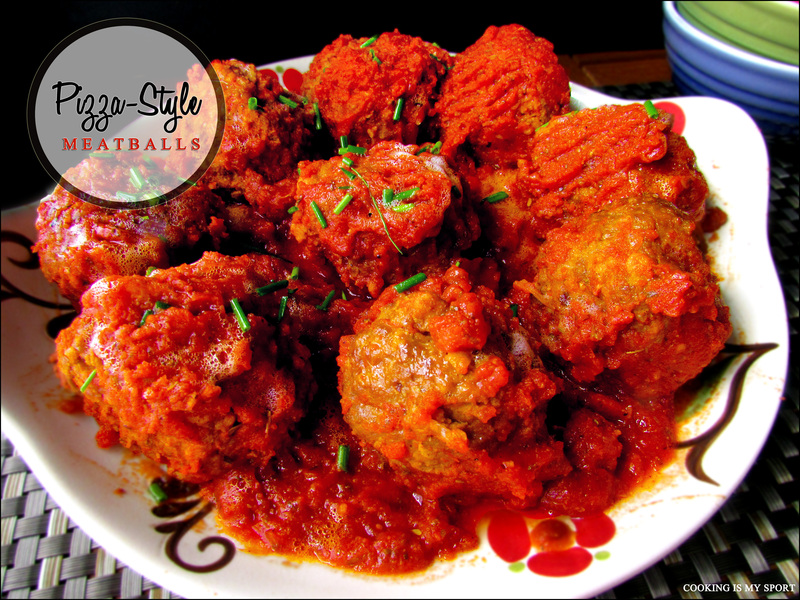 If you like meatballs, you will love these. If you like pizza, you will love these. If you don’t like either meatballs or pizza…you will still love these. Yep, you will. 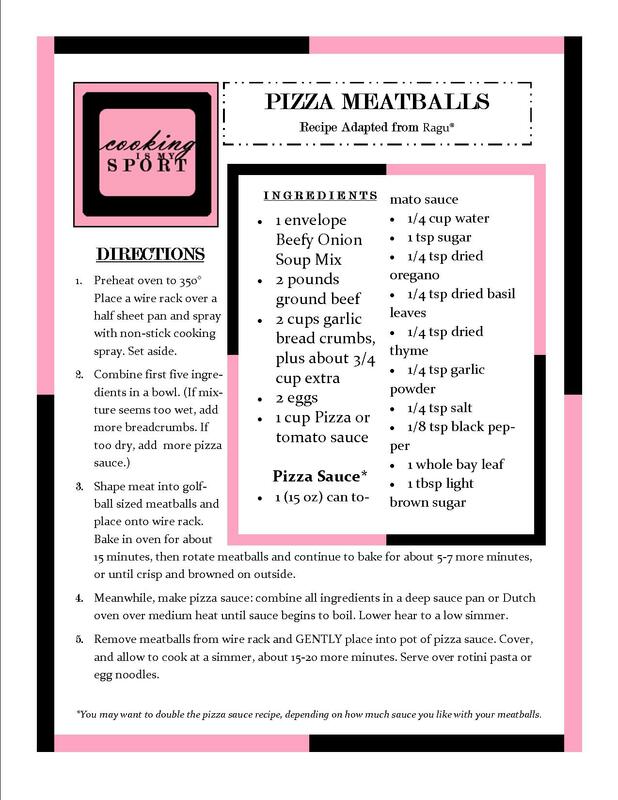 Note: You may want to double the pizza sauce recipe, depending on how much sauce you like with your meatballs. 1. Preheat oven to 350° Place a wire rack over a half sheet pan and spray with non-stick cooking spray. Set aside. 3. Shape meat into golf-ball sized meatballs and place onto wire rack. Bake in oven for about 15 minutes, then rotate meatballs and continue to bake for about 5-7 more minutes, or until crisp and browned on outside. 4. Meanwhile, make pizza sauce: combine all ingredients in a deep sauce pan or Dutch oven over medium heat until sauce begins to boil. Lower hear to a low simmer. 5. Remove meatballs from wire rack and GENTLY place into pot of pizza sauce. Cover, and allow to cook at a simmer, about 15-20 more minutes. Serve over rotini pasta or egg noodles. 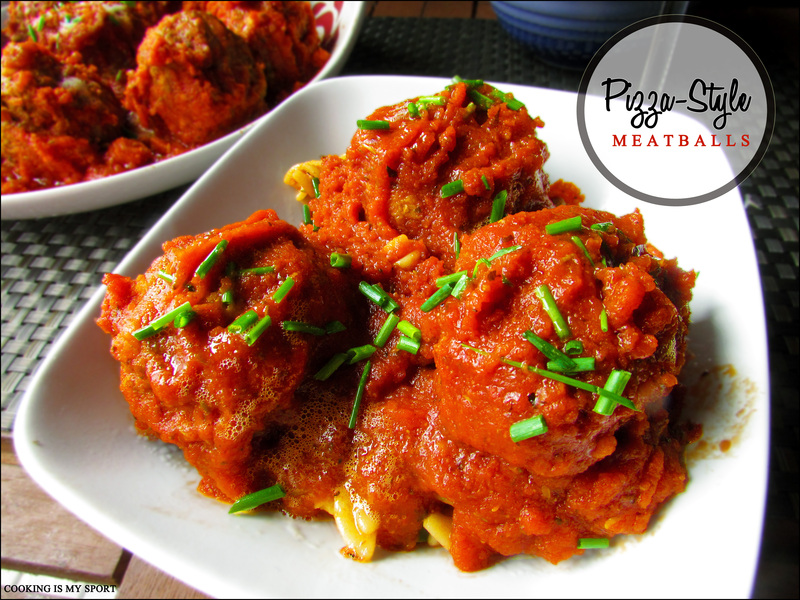 Posted	 August 1, 2014 at 1:39 pm by Ngan R.
Love pizza (check), love meatballs (check)…yes, I think I’m definitely on track to loving these pizza-style meatballs, Jess! Great dish and what a sweet story about Papa John’s (the non-jerk chain). Happy FF! Thanks Ngan- Happy FF to you too! 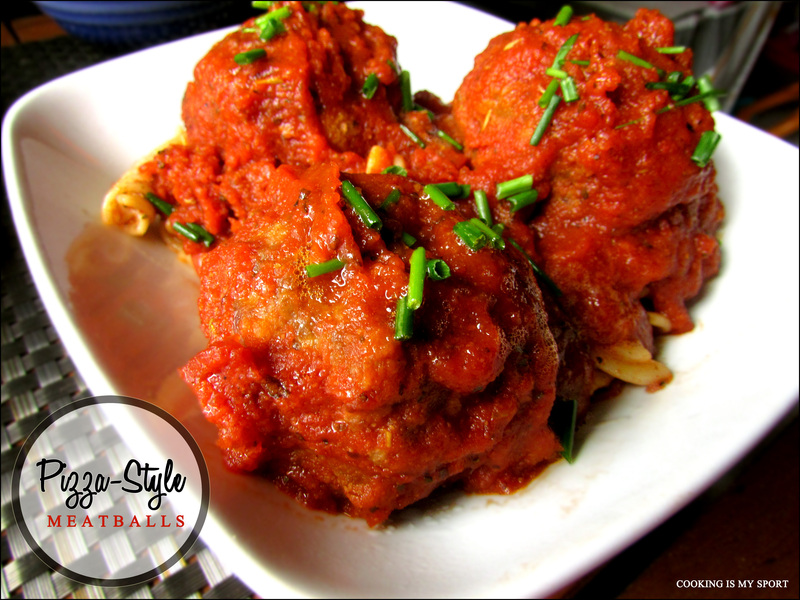 These meatballs look fantastic, Jess! I love how thick and rich the sauce is. Your memory of John the pizza guy was so sweet. Shows how being friendly and warm can make a difference to others. Loved your story…that’s sad that it closed down. These look yummy! Yum!!! What a great idea! Haha, yeah I left out the cheese because outside of pizza itself, I don’t really like it. But I think someone who is rather fond of cheese could melt some over these over the broiler. Thank you! I don’t dig cheese at all.. So perfect! Thank you Mandi, they are really good comfort food! Absolutely- anytime I hear pizza, I come running lol Thanks! I really like your memory stories. It’s true that great food with great people can really stick with you. This recipe would definitely be great as a meal or an appetizer! Thanks Suzanne, I hope wherever he is he’s still as happy and full of sunshine as ever. Thanks Margot, I was glad to share about him. He made something as simple as a pizza make a meaningful memory to a 7 year old, that’s pretty awesome to me! OMG looks very, very yummy and hearty! Then by all means, give him a taste of Heaven here on Earth lol Thank you! They look delicious Jess,can i make them with mutton.. Yummyy!! 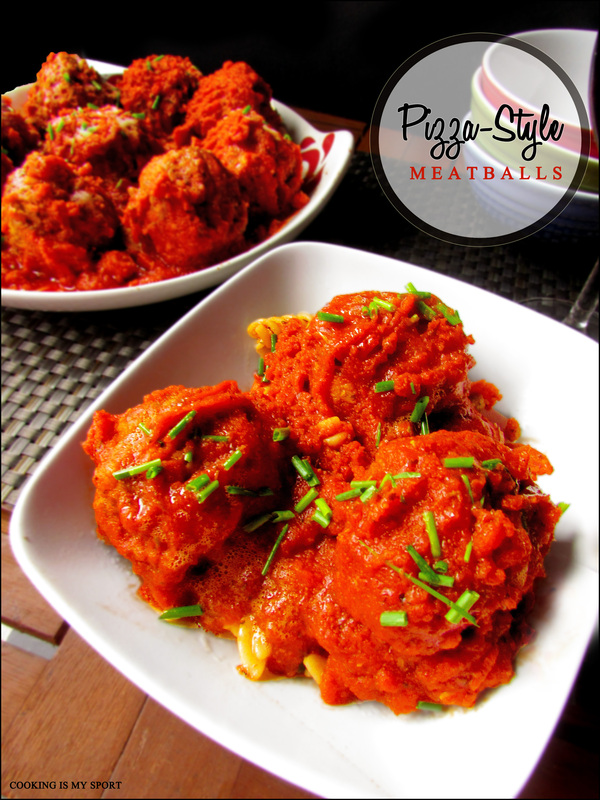 Pizza style meatballs sounds amazing.. and they look amazingly delicious too.. can’t wait to give it a try!! Thank you Arpita, I think you’ll like them! I hope your Papa John finds this post – and sees what an inspiration his pizzas were. I also like to recreate great flavours that are attached to memories and make them my own. This dish looks delish! Thanks for the recipe! !Meat balls sound super delicious!! You’re welcome, thank YOU for commenting! Anything pizza you can count on me so will definitely try veggie version Jess. … thanx a bunch….. I love your pizza memory Jess! When I was younger, we would always get pizza delivered on Fridays and then watch sitcoms on television 🙂 These meatballs sound delicious!! I absolutely love this, Jess. 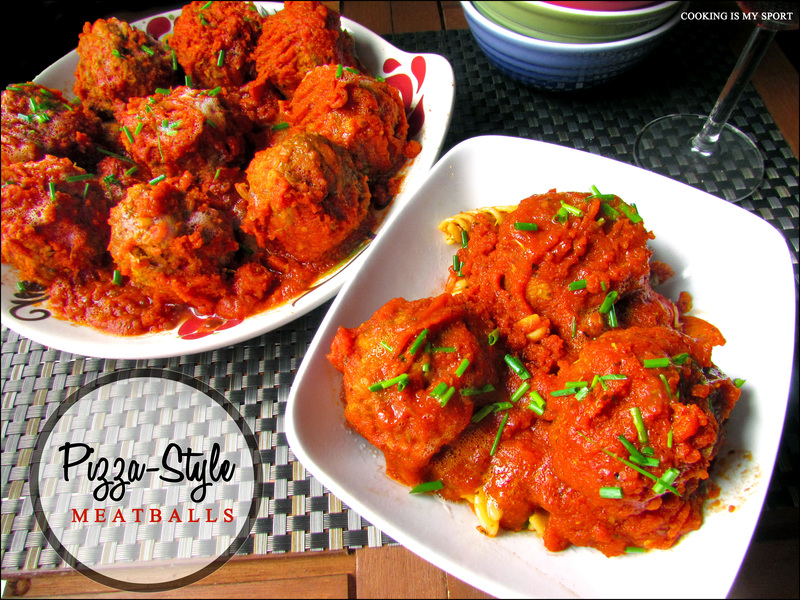 Pizza style meatballs- everything you could ask for in one dish. Since we don’t eat beef and would probably make this with ground chicken. And I am with you on not liking Papa Johns Pizza- terribly over-rated! Ground chicken or turkey would work fine- thanks Aditi! It’s a really good combination, I found. Thank you for commenting! Yes, this is PURE comfort food. Thank you! You’re welcome Kloe, I think you’re right. Give it a try and tell me how it turned out, thank you! Meatballs are my passion. I could eat them every day, they never make me bored, never! Your recipe is very original, I cannot miss the opportunity to give it a go! Thanks a lot for sharing!